Delerium was formed in 1987 by Bill Leeb and Rhys Fulber, and their first release was the 1988 album, Faces, Forms And Illusions. After this, they released a bunch of albums and singles. The group has always been a duo but the lineup has changed over the years although Bill Leeb has always been the key character. After the release of the album Karma, Rhys Fulber quit the group and Chris Peterson came in. With the album Chimera, Fulber came back and stayed for the rest of the albums. The big breakthrough came with the 1997 album, Karma which featured the single Silence (with singer Sarah Mclachlan). The single was released in 1998 and later peaked at no1 in the irish chart the year after. The cool thing is that it was the Airscape-remix which recieved the radio airplay. The single was re-released in 2000 with remixes by Tiësto, Fade and Airscape and did even better in the charts worlwide. Tiesto’s In Search Of Sunrise-remix became one of trance biggest anthems and is still played by most trance-djs worldwide. It is one of those track that most people sing along with when they hear it played in a club. The single has since being re-released in 2004 (with remixes by Above & Beyond), 2006 (with remixes by Filterheadz) and in 2008 (with remixes by Niels van Gogh and Thomas Gold). Worth noticing is that the Filterheadz-remix is often mislabeled as Trentmoller 2006 remix, which doesn’t excist. The huge success of Silence ended in most delerium-singles after this being remixed for the dancefloors. The next single, Heaven’s Earth (with singer Kristy Thirsk), released in 1999 also did well in the charts and was late remixed by Matt Darey in 2000. 2000 also saw the release of the album, Poem. The followup-single was the 2001 single, Innocente (with singer Leigh Nash from the band Sixpence Non The Richer) which also did well in the charts and peaked at no 3 in the US Dancechart. The remix-package was delivered by Tiesto, Lost Witness, Deep Dish and Mr. Sam. The year after saw the single Underwater (with singer Rani). Again, the single did well in the charts and peaked at no 9 on the US Dancechart. Underwater came with a remix-package from Rank 1 & Above & Beyond. The official single and video-release is the Above & Beyond edit. 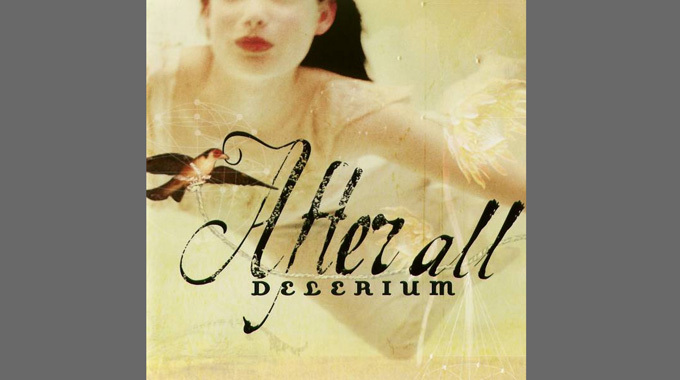 After All (with singer Jaël) came out in 2003 was the first single from the new album, Chimera. The new album focused more on pop-music than the former album. The track also came with a remix-package from Svenson & Gielen and Satoshi Tomiie. The track didn’t do that well in the charts, but did peak at no 9 in the US Dancechart. The official single and video-release was released in 2 versions, one as album version and one as the Svensson & Gielen edit. The second success from the Chimera-album came with Truly (with singer Nerina Pallot), again did pretty well in the charts and peaked at no 2 in the US Dancechart. The remix-package came with remixes from Infusion and Signum. The 2007 single Angelicus (with singer Isabel Bayrakdarian) peaked at no1 on the US Dancechart and came with a remix-pack by Andy Moor and Redanka. It was followed by Lost & Found (with singer Jaël) which peaked at no 4 on the US Dancechart. The remix-package came with a beautiful Blank & Jones-remix). Both tracks were featured on the 2006 album, Nuages du Monde. The last single from Delerium, Dust In Gravity (with singer Kreesha Turner) was released in 2009 and again peaked at no1 in the US Dancechart. The remix-package was this time delivered by Sultan & Ned Shepard, Nervo and Niels van Gogh vs. Dave Ramone. IMHO, Deleriums career peaked between 2000-2003, atleast dance-wise. The cool thing with their tracks is that there is always a version that fits your mood. If you’re tired of dancemusic, then put on the albums for some nice ambient chillout. The music and the style of Deleriums original material is timeless and hopefully people will remember them as well as the dancemixes. If not, they will always be remebered for Silence. Because that’s a true classic!